2018년 7월20 – 24일 캐나다 토론토 쉐라톤 센트럴 호텔(Sheraton Centre Toronto Hotel)에서 68번째 ACA (American Crystallographic Association) Annual Meeting이 개최되었다. 이번 학회에는 세계 각국에서 온 1,000명 이상의 과학자들과 대학원생들이 참석을 하였다. 워크샵을 포함 총 45개의 세션이 5일 동안 진행되었으며 200여명의 저명한 과학자와 젊은 과학자들이 함께 발표를 하였다. 이번 학회에서는 하루를 3 parts(오전/오후/저녁으로)로 나눠서 각 part당 4~6개의 category에 대한 symposium이 동시에 진행되었다. 그리고 3일간 매일 2시간(오후 5시 30분부터 7시 30분까지) 동안 진행된 포스터 발표 session에서는 200여개의 포스터에 대해서 세계 각국에서 온 발표자들과 과학자들이 다양한 주제에 대해 심도 있는 토론과 활발한 교류가 이루어졌다. 특히 이번 학회에서는 생체 내 단백질 구조를 규명하는 방법으로 결정학에 대한 발표뿐만 아니라 다양한 최신 방식의 구조 분석 기술들과 그에 대한 결과도 발표 되었다. 학회가 개최된 쉐라톤 호텔 바로 길 건너편에는 토론토 시청이 있어서 교통 접근성이 좋았다. Reception Desk에서 참가자에게 친절하게 설명을 하고 있는 학회 직원들. 이 workshop은 총 6개의 Session으로 8시간 동안 진행이 되었고 각국의 유명한 박사님들이 발표를 하셨다. 본 워크샵은 pre-registration이 필수였고 EM workshop의 경우에는 등록비가 $110 이었다. 최근 세간의 관심을 증명하듯, 늦게 참석한 분들은 자리가 없어, 바닥에 앉아 강연을 들을 정도로, 다른 workshop에 비해서 훨씬 많은 참석자가 있었다. Workshop이 진행되었던 Provincial North Hall. Crystallography 학회 임에도 불구하고 동시에 진행된 4개의 workshop 중 가장 참석자가 많았다. CryoEM workshop의 Introduction을 맡았던 Wah Chiu 교수님의 Recommended Readings. Toronto Univ.의 Computer Science 전공 박사과정 학생인 Ali Punjani가 기존에 잘 알려진 CryoEM processing program인 RELION과 EMAN에 영감을 받아서 새로운 Algorithm (stochastic gradient descent (SGD) and branch-and-bound maximum likelihood optimization algorithms) 을 가진 cryoSPARC이라는 web-based program package를 개발하였고 Structura Biotechnology Inc. 회사도 설립했음을 이야기하였다. 이 ‘cryoSPARC’ 라는 프로그램은 상대적으로 저사양의 컴퓨터로도 cryo-EM structure에 대한 calculation을 가능하게 해준다는 장점을 가진다고 소개를 해주었다. 이 프로그램은 다른 software보다 빠른 계산 속도를 가져, 26S proteasome 같은 경우에는 3시간 안에 high-resolution structure를 만들어 낼 수 있다. 특히 다른 cryo-EM package program에서는 일일이 진행해야 했던 structural heterogeneity selection을 manual picking하는 반면, cryoSPARC에서는 auto-selection이 가능하기 때문에, 동시에 여러 가지 conformation을 가진 구조를 규명할 수 있다. X-선 결정학에서는 새로운 구조를 규명하기 위해서 phase problem을 해결하는 다양한 방법 (MR, SAD, MAD, MIR)이 존재하는데, cryoEM은 image 자체를 보기 때문에 X-선 결정학에서 사용하는 이런 방식으로 구조를 규명하지 않는다고 한다. 그렇다면 단백질 polypeptide chain의 N-terminus와 C-terminus를 구분하는 것은 단백질의 구조 모델을 만들어 내는 반드시 필요한 작업이다. X-선 결정학에서는 phasing problem을 해결하며, 이러한 문제를 해결할 수 있다. 그러나 cryoEM은 image를 이용하여 electron density map을 얻을 수 있지만, 단백질의 N-terminus와 C-terminus를 구분하기 어렵다. 따라서 기존의 EM기법에는 다른 방식으로 비슷한 단백질의 구조가 이미 풀려 있는 경우에 MR (Molecular Replacement)이라는 방법과 비슷한 원리로 구조를 규명하는 정도였다. 그러므로, cryoEM에서 기존에 알려져 있지 않은 de novo 구조를 어떻게 규명할 수 있는지에 대해서 많은 논의를 있었다. 현재까지는 technical limitation 때문에 <3.x Å 의 High resolution의 구조만 de novo modeling이 가능하다고 하였다. 여기서 소개된 방법으로 첫번째 방법은 생물학 이외의 다른 분야에서 많이 응용이 되고 있는 algorithm 중 하나인 TSP (Travelling salesman problem)와 Cα 간의 거리(이를 restrain factor로 정해서 mainchain을 tracing 하여)를 복합해서 사용하는 방식으로 image processing을 통해서 생성된 electron density map에 무작위로 atom을 scatter 시킨 후 이 atom들의 Cα 간의 거리가 3.5 ~ 3.8 Å 이라는 restriction factor를 주어 단백질의 main chain을 찾는 de novo modeling 진행한다. 두 번째 방법으로는 secondary structure prediction과 함께 bulky hydrophobic residue의 position을 가지고 mainchain을 tracing 하여 de novo modeling을 하는 것으로 고분해능 구조의 경우에는 α-helix나 β-sheet이 구조가 보이는데 이를 바탕으로 연결되어있는 전자 밀도를 이어서 어느 쪽에서 N-terminus가 시작이 되는지 확인을 한다. 그리고 어느 정도 확인이 되었을 때는 Tyrosine이나 Tryptophan 같이 bulky side chain을 갖는 residue들의 secondary structure 위의 position을 비교해서 de novo modeling을 진행을 한다. 이 세션에서는 Crystallography 이외의 다른 method에 대한 application이 있었는데 대부분 SAXS (Small Angle X-ray Scattering)에 관한 내용이었다. 1) Solving the phase problem in solution scattering. Buffalo Univ.의 Thomas Grant 교수님이 이 발표를 하셨는데, 구조하는 랩에서 흔히 접할 수 있는 SAXS (Small Angle X-ray Scattering) model을 만드는데 기존에 알려져 있는 것과 다른algorithm에 대한 내용이었다. 기존에 publish가 된 많은 SAXS 관련 논문들은 1D plot을 이용해서 3차원 modeling을 하는 algorithm을 가지고 있는데, 이 세션에서는 iterative structure factor retrieval algorithm이라는 새로운 방식을 통해서 solution scattering data로부터 직접 electron density를 구하는 방법을 소개를 하였다. 이 방식은 반복적으로 같은 식의 계산을 진행하는데 negative density가 없어지는 방향으로 계산이 진행되며, 각 계산에서는 매번 다른 structure가 나올 수 있기 때문에 align과 averaging을 함께 반복하는 방식이라고 한다. 이 방식을 통하면 Fourier transform 에 기반한 model이 아닌 scattering에서 직접 electron density map을 만들어 낼 수 있다고 한다. 이 방식은 기존에 SAXS 분석방식보다 좀 더 정확한 정보를 얻을 수 있다고 한다. 기존의 Bead modeling 방식과 Direct Electron Density Calculation에 의한 구조를 비교하는 모습. 2) CryoEM for drug discovery, design, understanding and application. Hybrid Technique 세션이 진행되는 사이에 Transaction symposium이 있어서 개인적으로 관심 있는 cryoEM 세션을 들었다. 이 세션에서는 Merck & Co. Inc. 소속의 과학자인 Giovanna Scapin이 발표하였다. Merck에서는 기존의 구조를 기반으로 한 약물 연구를 많이 진행 해왔는데, 그 방식이 현재의 X-선 결정학에서 cryoEM으로 많은 변화를 하였다는 내용과 함께 새로운 약물 개발을 하고 있는 내용에 대해서 소개를 해주었다. 현재 Merck에서는 다양한 질환의 원인이 되는 단백질 구조 규명을 시도하고 있는데, 이번 발표에서는 그 중 Insulin-Insulin receptor complex의 고해상도 구조를 cryoEM을 이용해서 규명한 내용을 이야기했다. 이 발표에서는 cryoEM에서 흔히 겪는 문제에 대한 해결 방안을 주로 발표를 하였다. 기존 cryoEM에서 vitrification 과정은 대부분이 FEI (현재는 Thermo scientificTM)에서 개발한 Vitrobot이라는 장비를 가지고 진행이 되어 왔는데, Merck cryoEM team에서는 이 장비가 아닌 새로운 vitrification 장비인 Spotiton를 사용하여 grid 사용 효율을 증대 시키고, screening time을 비약적으로 단축시켰으며 높은 재현성을(vitrobot의 가장 큰 단점으로 지적이 되는 것이 재현성임) 가지는 것을 확인하여 이를 이용해서 cryoEM grid를 preparation을 하였다고 한다. 또한 cryoEM에서 단골손님으로 등장하는 문제인 preferred orientation problem을 겪었는데 이 경우에는 tomography에서 사용하는 plate tilting 기법과 Ultra-fast plunging 방법을 이용해서 해결을 했다고 한다. 이를 통해 Merck 에서는 4.3 Å의 고해상도 구조를 규명했다. 해당 세션에서는 현재 구조생물학 분야에서 가장 Leading edge에 있는 과학자들이 최신 논문에 실린 내용을 발표 하였고 동시에 현재 cryoEM 장비 현황이나 기술적인 개발 상태 및 알고리즘에 대해서 함께 발표를 하였다. 1) Single-Particle Cryo-EM Studies of Lipopolysaccharide Transport. MsbA는 Gram-negative bacteria의 outer membrane을 구성하는 중요한 성분 중 하나인 Lipopolysaccharide (LPS) 를 수송하는 transport로 cytoplasm에서 생성된 LPS를 inner membrane을 통과하여 periplasm로 이동을 시켜주는 flipase이다. 이번 발표에서는 ATP-binding cassette transporter인 MsbA의 다양한 state의 고해상도 구조를 cryo-EM을 이용하여 규명한 내용을 설명하였다. 이 발표에서는 MsbA의 구조를 규명할 때의 문제 해결 방법에 대해서 주로 이야기를 하였다. (cryo-EM에서는 computation을 주로 사용하므로, troubleshooting에 관한 발표가 많았던 것 같다.) 일반적으로 cryoEM 전 sample 상태를 screening하기 위해서 주로 Negative stain TEM을 이용한다. 이때 일반적으로 membrane protein들의 정제에 사용하는 DDM(detergent)을 넣어, detergent shell이 형성되는 것을 이용하는데, DDM으로 negative screening을 진행했을 때는 structural heterogeneity 가 존재하여 고분해능의 구조를 풀 수 없었다고 한다. 이 문제를 해결하기 위해 lipid nanodisk(특히, MSP1D1 & MSP1E3D1)를 이용하여 membrane을 reconstruction 하면 structural heterogeneity가 사라져 uniform conformation 상태의 sample을 만들 수가 있고 이렇게 reconstruction 된 protein-lipid nanodisk complex를 cryoEM을 이용해 고해상도의 구조를 얻었다고 한다. 또한 ATPase activity assay를 진행할 때, 기존에 많이 사용하던 liposome based assay보다 lipid nanodisk based assay에서 좀 더 reasonable하고 높은 activity를 보이는 것을 확인할 수 있었다며, membrane protein 연구에서 lipid nanodisk의 중요성을 강조했다. 2) Near-atomic resolution CryoEM analysis of the Type III Secretion Injectisome. Bacteria secretion system은 크게 sec-independent (type I, III and IV)와 sec-dependent (type II, V)로 나눠져 있다. 이 발표에서는 그 중에서 가장 크기가 큰 type III secretion system에 관한 연구 결과를 발표를 하였다. Bacteria의 type III secretion hole complex의 경우에는 약 3 MDa이나 되는 거대분자 인데, 이 복합체는 3개의 membrane (host membrane, bacteria outer membrane, bacteria inner membrane)을 관통하는 막 단백질이기 때문에 전체 구조를 한 번에 규명하는 것은 쉽지 않다고 한다. 그래서 작용을 하는 파트 별로 구조를 푼 내용을 위주로 설명을 진행하였다. X-선 결정학을 사용하는 것은 물론, 큰 부분들의 경우에는 cryoEM, 그리고 intrinsically disorder protein의 경우에는 NMR 등의 다양한 기법을 이용해서 구조를 연구를 한 것이 인상적이었다. 특히 그 중에서 P. aeruginosa의 ruler protein PscP이라고 하여 needle (T3SS의 bacteria outer membrane과 host membrane을 이어주는 부분) length를 sensing 할 수 있는 Model에 대해서 자세히 설명을 하였다. PscP의 N-terminal에는 intrinsically disordered domain이 존재하는데 bacteria는 이것을 needle의 길이를 조절하는 ruler로 사용한다고 한다. 여기에 존재하는 conserved FEQA motif가 C-terminal globular domain과 함께 T3SS의 Needle의 길이를 측정해서 정확한 length가 될 수 있도록 조절한다는 내용이었다. 구조생물학은 다른 분야들과 다르게 상대적으로 유행에 민감한 학문 임에도 불구하고 Natalie Strynadka group에서는 20년 동안 한 가지의 거대 분자의 구조를 다각도로 구조 및 생화학적 특징을 분석하는 것이 대단하다고 생각이 들었다. 1) Molecular Therapy for 2.5-4Å Models: Anecdotes and Progress from the CryoEM Model Challenge. 이 발표의 연사는 Duke Univ.의 Jane Richardson 교수님으로 구조생물학자라면 한 번쯤은 꼭 접해보았을 Molprobity라는 structure validation server을 개발한 분으로, 요즘 이슈가 많이 되고 있는 cryoEM 구조의 validation에 대해서 이야기를 하였다. (특히 단백질) 생체 분자의 구조를 풀어서 논문을 투고할 시에 PDB (Protein Data Bank) validation report를 요구하는 논문들이 상당히 많은데, 이 validation에서 핵심적인 역할을 하는 program이 Molprobity이다. 발표에서는 기존에 X-ray crystallography 구조를 validation을 하는 Molprobity server로 cryoEM 구조를 validation을 하면 여러 가지 문제점이 있다고 한다. 현재 X-ray crystallography를 위한 Molprobity의 경우에는 Rfree, electron density fit 등의 criteria를 기반으로 하고 있는데, cryoEM structure validation에 이 criteria를 그대로 사용하면 많은 문제점이 있을 수 있다고 한다. 그래서 cryoEM structure validation을 위해 CaBLAM이나 Cis-nonPro peptide라는 새로운 validation program이 개발 혹은 개선되었으며 cryoEM structure의 경우에는 이를 이용해서 validation 하는 것이 정확하다고 한다. 특히 CaBLAM의 경우에는 Cα-Cα 사이의 거리를 기반으로 validation을 하며, 2.5~4Å의 상대적으로 고해상도의 cryoEM 구조의 경우에는 large scale virtual dihedral illuminate가 가능해서 cryoEM structure 를 validation하는데 적절하다고 한다. 2013년 PNAS에서 한바탕 소동이 있었던 cryoEM fake structure에 대해서도 언급을 하면서 validation criteria를 엄격하게 만들 것이 중요하고, 현재 cryoEM community에서는 이에 관한 논의가 계속해서 진행중이라고 한다. 1) CASIS Perspective on the Use of the International Space Station National Laboratory for Crystallization Experiments. Microgravity 상태를 유지하고 있는 우주정거장의 모습. 이렇게 gravity가 적은 상태에서는 결정이 더 잘 성장 할 수 있다고 한다. 2) Microgravity protein crystal growth for x-ray and neutron crystallography: What works and what would not! 앞 세션이 우주정거장에서 다양한 실험들이 진행되고 있다는 발표를 하였다면, 이번 발표에서는 실제 우주정거장에서의 실험에 참가한 group의 결과를 발표하는 자리였다. 이 group에서는 결정의 크기를 크게 만들었다는 것을 중점적으로 발표를 하였는데 이를 통해 우주정거장에서 만들어진 큰 crystal은 Neutron diffraction을 이용한 연구에 용이하다고 한다. Neutron diffraction은 일반적인 X-ray diffraction에서 얻을 수 없는 중성자에 관한 정보를 얻을 수 있기 때문에 Enzyme의 molecular mechanism을 규명하는데 중요한 역할을 할 수 있지만, 기술적으로 diffraction을 시키는 crystal의 크기가 매우 커야만 진행을 할 수 있다. 이러한 문제점을 해결하기 위해 사용되는 우주정거장 같은 microgravity의 상황에서는 결정화를 진행할 때, nucleation이 적게 일어나는 동시에 거의 모든 액체가 diffusion이 일어나서 결정이 일반 중력 (지구의 중력) 상태에서보다도 훨씬 크고 단단하게 자랄 수 있다고 한다. 성공사례로 보여준 cytochrome C의 경우에는 일반적인 상황에서 결정을 키웠을 때 100 ~ 200 nm 정도밖에 자라지 않았으나 같은 조건이지만 미세 중력 존재 하에서 결정화를 하면 2000 ~ 3000 nm 의 크기까지 자랄 수 있었다고 한다. 최근 NASA의 도움으로 nature publishing group에 Nature microgravity 라는 자매지가 발간이 되어 이에 관한 연구들은 더욱더 활발하게 진행이 되고 있다고 한다. 그리고 후속 연구로 crystallization 뿐만 아니라 microgravity에서 cell culture도 진행 중이라고 한다. 1) Better Data with SEC-SAXS. 이 세션에서는 Stanford university에 있는 SLAC National Accelerator Laboratory에 SAXS beamline BL 4-2담당자인 Thomas Weiss 박사님이 현재 빔라인에서 사용하고 있는 SEC-SAXS의 strategy에 대해서 소개를 하였다. 비교적 최근에 batched SAXS를 대신하여 SEC-SAXS technique이 개발이 되어서 protein aggregation을 효율적으로 제거를 할 수 있게 되면서 SAXS에 많은 변화가 있었다. 하지만 이런 SEC-SAXS에도 문제점이 있는데 그 중에 하나가 capillary fouling이다. Capillary fouling은 지속적인 x-ray 에 의한 capillary가 damage를 입어서 background level이 변화 하는 것을 의미한다. 장시간 동안 x-ray를 열어서 같은 capillary에 빔을 조사할 경우 시간에 따른 capillary의 background의 변화를 간과하면 background level을 substrate할 때 어떤 부분을 background로 잡느냐에 따라서 structure noise가 다르게 발생 할 수 있다고 한다. 그래서 이 빔라인에서는 이를 해결하기 위해서 x-ray shutter 를 UV detector에서 protein이 elution 되는 것을 확인하고 그때만 열어서 data collection을 진행함으로써 capillary radiation damage를 최소한으로 줄여capillary fouling을 막는다고 하였다. 추가적으로 이 beamline에서의 SAXS setting은 1번의 실험당 5~10 mg/mL정도의 50 uL 이하의 sample만 필요로 하기 때문에 기존에 있는 다른 beamline들에 비해서 적은 sample로도 SEC-SAXS를 진행 할 수 있다고 한다. 그리고 2.4 mL 짜리의 small volume size exclusion chromatography를 이용하며 flow rate도 매우 저속인 0.04 ~ 0.1 mL/min정도를 사용하고 있다고 한다. 또한 beam의 출력을 11 keV에서 12.4 keV로 올리고 준비된 sample에 DTT 를 첨가하는 방식도 적용하여 기존에 SEC-SAXS data 보다 좋은 quality의 data를 모을 수 있다고 한다. SLAC의 SSRL BL 4-2 beamline의 현황. Thomas Weiss 박사님은 shutter control이 high quality의 SEC-SAXS data를 얻는 좋은 방법이라고 말하였다. 2) Crystal structure of a 6.5 MDa bacterial microcompartment shell. Bacterial microcompartments (BMCs)는 매우 크고 아주 많은 단백질로 이루어져 있는 enzyme complex 이다. 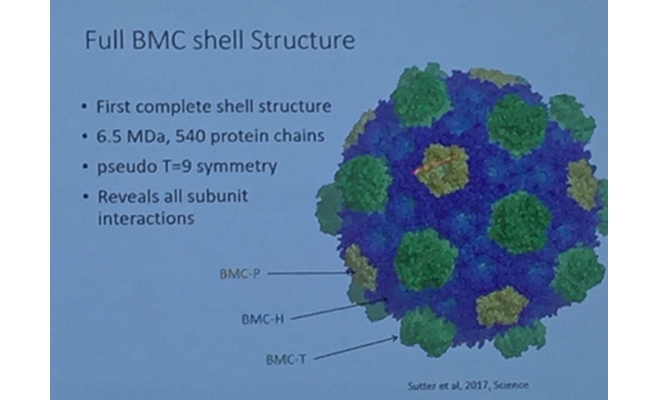 이러한 BMC는 bacteria 내에서 매우 다양한 metabolic pathway에 기능하는 것으로 알려져 있는데, 이 BMC는 BMC-H, BMC-Ts, BMC-TD, BMC-TP의 복합 단백질로 구성이 되어있다고 한다. (이전까지는 조성이 정확이 어떤지 알지 못했다.) 자세한 구조적인 정보가 알려져 있지 않아서, 이 group에서는 구조를 풀고자 먼저 결정화를 진행하였다고 한다. (정제를 어떻게 했는지 궁금했지만 그 방법에 대해서는 소개하지 않았다.) 하지만 initial crystal의 경우에는 16 Å 정도 밖에 회절을 하지 않아서 다양한 결정화 technique을 통하여 결정을 improve하였고, 이렇게 만들어진 결정은 3.5 Å까지 회절을 하였지만(C 2 2 2 space group, 394 x 638 x 642 unit cell, 굉장히 거대한 unit cell을 가지고 있다.) 결정학에서 가장 중요한 단계 중의 하나인 phasing 을 해결 할 수 없었다고 한다 (Heavy atom, NCS averaging [self-rotation function; Icosahedral symmetry]을 시도를 하였지만 구조를 풀 수 없었다고 했다.). 구조를 규명하기 위해 여러 방법 중 low resolution structure를 이용해서 phasing을 해결하는 시도를 하였는데, cryoEM을 통해서 low resolution ~ 8 Å의 구조를 만든 후 이를 이용해서 phasing problem을 해결했다고 하였다. 그리고 팁으로 말해 준 내용으로는 이렇게 high symmetry를 갖는 경우에 refinement 시 NCS averaging method를 사용하면 훨씬 좋은 electron density map을 만들어 낼 수 있었다고 이야기 하였다. 이 구조를 통해서 BMC가 540여 개의 단백질로 6.5 MDa의 거대 분자를 이루고 정확히는 BMC-H, BMC-Ts, BMC-TD, BMC-TP의 구성을 알 수 있었다고 한다. - 자세한 내용은 http://science.sciencemag.org/content/356/6344/1293 참고. 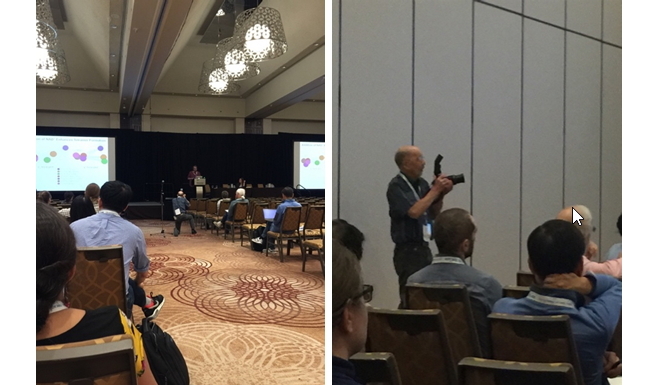 매년 열리는 American Crystallographic Association Annual meeting이 Toronto에서 성황리에 개최되었다. 결정학을 바탕으로 한 다양한 학문들이(물리, 화학, 생물학) 한데 모여서 열띤 토론의 장을 만들었다. 특히 관심이 갔던 것은 2017년 노벨화학상을 cryo-EM이 수상을 하면서 약 60여년 동안 구조생물학의 중심이었던 X-선 결정학자들의 구조생물학을 연구하는 한 가지의 tool로 cryo-EM에 대한 생각이었는데, 세계에서 유명한 결정학자들 조차도 지대한 관심을 갖기 시작하였고 이를 받아들일 준비가 되어있는 모습이 인상적이었다. 또한 SAXS나 EM를 비롯한 다양한 hybrid techniques이 꾸준히 개발이 되면서 bio-molecule에 대한 연구가 앞으로 더욱더 활발해질 것이라는 느낌을 받을 수 있었다. 학회 내내 보이셨던 노년의 사진기사 선생님. 매 세션마다 열정적으로 사진을 찍으시는 모습이 인상적이었다.